It’s that time of year again, and we have another fantastic field of teams. Familiar names and up and coming programs are represented respectively at the X once again as the exciting section playoffs spill over to St. Paul and the greatest High School sports tournament in the country. In game one of the afternoon session we get #2 seed Maple Grove (24-2-2) vs. Hill Murray (22-6). Maple Grove finally gets over the hump and past arch rival Blaine using a 15 goal outburst in the section 5AA championship game. The Crimson are poised for a run in this tournament and have been among the top 5 teams in the state since the beginning of the year. Led by forwards Dylan Steman, Tony Paulson, Spencer Bell, defenseman and Notre Dame recruit Jordan Gross among others, the Crimson are as complete a team in the tourney. The Hill Murray Pioneers (22-6) are no strangers to the Tournament, and are back after a one year hiatus. Led by forwards Jake Guentzel, Zach LaValle, Charlie Sampair and Andy Faust. The Pioneers started slow this year as they introduced a relatively inexperienced blueline unit to the Varsity level. Hill Murray is never short on talent, and can beat any team in the state on any given night. Game 2 of the afternoon session pits the Moorhead Spuds vs. a super talented Eagan squad that was knocked out of the tourney last year by eventual champion Eden Prairie in the semifinals. Eagan was rewarded the #3 seed after posting a 24-3-1 record coming in to thursday. Led by University of Maine recruit and Mr. Hockey candidate Will Merchant Princeton bound Michael Zajac talented defensemen Eli May (Minnesota State) and Sam Wolfe (Maine). Depth and experience at the X can only help the Crimson make a run. It seems like every year for the last 20 years the Moorhead Spuds have been coming to St. Paul in early march to compete in this tournament. In fact 12 out of the last 20 years the Spuds have represented section 8. Led by senior goaltender Michael Bitzer a Frank Brimsek award finalist, and the Uglem brothers Tony and Nicholas. The last game the Spuds played against top competition was a 6-1 loss to Hill Murray. Coach Dave Morinville will do his best to put that loss behind them and focus on a game plan based around the stellar play of his great goaltender. If Bitzer is as good as he can be the Spuds have a legitimate chance to make some noise next weekend. Last year if not for the will of the great Kyle Rau, the Duluth East Greyhounds very well could be returning to the X as defending state champions. And it shows as the Hounds went 27-1 this season, and were the #1 team in the state for most of the year. Dom Toninato and Jake Randolph are the best 1-2 punch you’ll see in High School hockey. When firing on all cylinders they will not be beaten. Lakeville South has a young man by the name of Justin Kloos, who only had 99 points this year. With a player like that you always have a chance, slim as it may be. The Cougars are 20-8 on the season and drew a tough first round foe. Playing in the deep South Suburban conference most definitely means South will not be intimidated by the Hounds. 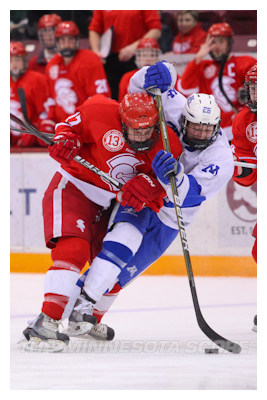 In the most intriguing matchup of quarterfinal thursday has to be the Benilde-St. Margarets vs. #4 seed Edina. The Red Knights are flying high after destroying Minnetonka last week in the section 6AA finals. And the Hornets have surprised everyone this year with a young team that has been amongst the top teams in the state since game 1. When you talk about the Red Knights you could mention so many names, Grant Besse, Dan Labosky, Christian Horn just to name a few. They are 3 lines deep of strong forwards, and a much improved blueline which is why this team might be the hottest squad going right now. Inspired by their injured teammate Jack Jablonski, you have to wonder if this team is destined to hoist the trophy saturday night. One senior skater on the roster? Rebuilding year? NOPE. The Hornets are back to the tourney for the sixth straight year with a group of youngsters that at the beginning of the year were shrugged off for their inexperience. Led by sophomore standouts Dylan Malmquist and Connor Hurley, Edina looks poised to make a few runs in this and the upcoming years. Louie Nanne, a name we all know is the most experienced player on the roster and they’ll need him to keep the team even keeled as they arrive in St. Paul. Behind 2 goals from senior forward Jake O’Borsky and relentless offensive pressure from their 3 strong lines, the Benilde-St. Margarets Red Knights are heading back to the X for the first time since 2007-08 after knocking off the #2 ranked Minnetonka Skippers. Sophomore forward Zack Hale opened the scoring for Benilde early in the first period, a huge goal for the Red Knights third line. It was all BSM all the time, they set the pace and gave themselves numerous scoring opportunities early in the game. Jake O’Borsky would make it 2-0 at 6:31 of the first as an astonished crowd saw Benilde control the early going.The Skippers would answer on a flukey rebound goal that fell onto Sam Rothstein’s stick at 8:35 of the first to make it 2-1. The second period began with Minnetonka bringing the intensity it lacked in the first. However they couldn’t cash in. At 15:12 of the second period on the power play O’Borsky would get the biggest goal of the game, a late period goal to give his team a crucial 3-1 lead going into the third period. Benilde would put this game away in the third period as Tyler Ellegard fired a soft wrister that confused goalie Paul Ciaccio and trickled into the net at 9:46 of the third to make it 4-1. Christian Horn would cap another strong performance with a goal to go along with an earlier assist less than a minute later to closeout the Skippers. In an emotional, and inspirational moment, Jack Jablonski was brought out onto the ice to receive a medal and take pictures with the team and their Section 6 championship trophy. On a weekend where we all had expected this much improved Gopher hockey team to get 4 points, to come out with 2 from saturday nights victory is a little disappointing. The Gophers showed flashes of brilliance on friday night, but were for the most part inconsistent, and unfocused. Kent Patterson was his usual self, making some unbelievable saves on some very disheartening defensive lapses. 3 different times we saw Gopher pass attempts made to players that were heading off on line changes, something that must have drove Coach Lucia absolutely crazy. In the end the Gophers went down 3-2 in OT getting goals from defensemen Mark Alt and Seth Helgeson. After a barrage of scoring chances and a game tying goal from Helgeson in the 3rd period, Tech’s Brett Olson dismissed the fans hopes of an OT win just :33 seconds into the OT on a beautiful charge to the net. Minnesota would come out on night 2 like the team that is 8-0-1 on saturdays this year. A whole different gear, if you will. The first set of shifts set the tone, as 4th liners: Joe Miller, Christian Isackson, and Nico Sachetti (none of whom suited up friday night) set the tone early as the U was on the attack. Kyle Rau would get his 12th goal of the season (leads the country in freshman goal scoring) on a nice little play set up by Mark Alt. Michigan Tech would answer, Jordan Baker’s goal at 16:35 of the first period, stole some thunder from what was an otherwise Gopher dominated 1st period. As UMD completed its sweep of Wisconsin, the Gophers put their best feet forward and finished this all important game prior to a layoff before the holiday tourney’s. Jake Hansen added a PP goal tipping in a beautiful shot by Eric Haula. In the 3rd period the Goph’s would pour it on getting 3 unanswered goals to put this game away. Mark Alt got his 2nd goal of the weekend, Nick Bjugstad got his 16th and senior Joe Miller from Wayzata got his 1st of the year. Things got ugly late as Minnesota’s Kyle Rau took a stick to the head late in the 3rd. This led the Gophers into a 5 on 3 situation, and Jake Hansen would get his 2nd goal of the night giving the Gophers a 6-2 lead. And then it got uglier, as Seth Helgeson and Carl Nielsen began what would take about ten minutes to settle down, both benches were exchanging unpleasantries, old school WCHA hockey, gotta love it…. I’m sure Minnesota would love to have friday night back, but it should be noted they had 34 shots on goal and 40 on saturday. They played far more consistently and with great focus, a very good way to head into winter break and the Holiday tourney. With the win the Gophers stayed on pace with the Bulldogs of UMD and remain tied for 1st in the WCHA. Friday night the Gophers got goals from four different players and Minnesota pulled away late on the strong goaltending of Kent Patterson and his 26 saves winning 4-2 over the Mavericks. Gopher scoring this year has been led primarily by the sophomore and freshman classes, however last night the upperclassmen got in the mix as Taylor Matson, Nick Larson, and Jake Hansen registered scores in the friday opener. Erik Haula put the Goph’s up for good at 4:51 of the 3rd period on the Power Play. Minnesota continued its strong 3rd period play and now have a 29-7 edge in final period scoring this season, the sign of a team that has learned how to close. On night two, the Golden Gophers came out looking like a team that wasn’t pleased with their performance the night before. Seth Ambroz got it started on the power play at 2:37 of the 1st period assisted by Zach Budish and Taylor Matson. Matson continued his hot weekend with a goal of his own for his 2nd point of the game assisted by his linemates Ambroz, and Nate at 8:24. And not to be shutout the best line in the country would get themselves on the board as Kyle Rau took a perfect pass from Mark Alt and cashed in easily at the weak side post for his 11th goal of his freshman season. Minnesota would take a 3-0 lead into the 1st intermission. In the 2nd period Minnesota State would come out with a bounce in their step as Zach Lehrke would score a power play goal just 2:32 in, assisted by Jp LaFontaine and Eli Zuck. Shots throughout the period would stay relatively close as the Gophers had a slightly lackluster 2nd period. Scoring chances for both teams went for not, and the period would end at 3-1 UM. The Mavericks didn’t get the memo. MSU would trim the lead to one goal on the power play with Lehrke getting his 2nd goal of the night and 5th of the season, assisted by LaFontaine again. The Gophers played the 2nd and 3rd periods in prevent mode, and it didn’t suit them well. Things would get interesting at the 11:12 mark as some questionable calls had both coaches upset, as Kyle Rau went to the box for embelishment. A hard fought series would end in a sweep, as Kyle Rau gets another game winner. The Gophers were too much for the Mavericks, as the Gopher’s were no doubt the better team. Seth Ambroz had a strong weekend after struggling as of late. Taylor Matson continues to show his leadership, and Nick Bjugstad asserts his dominance as perhaps the best player in the country. With the victory Minnesota takes over sole possession of first place in the WCHA. The game of the century was all that it was hyped up to be. Rarely at any level of football do you get to see the hands down 2 best teams play for a championship, we got it tonight. MaxPreps had this football game rated as its 5th best game in the country this weekend, finally a little Minnesota football love. As the second half began, Eden Prairie started to open some holes for Andrew Larsen. The Eagles would capitalize with another field goal from Jake Ibach late in the 3rd quarter. There were two plays in the second half that will distinguish this game forever. The Eden Prairie stand inside their red zone holding Wayzata to a field goal and in turn holding onto an all important lead. Alex Scott the talented kicker from Wayzata put the Trojans on the board, 6-3 EP. In the middle of the 4th quarter after a muffed punt by Wayzata, Ep would have a 4th down and 15 deep in Wayzata territory. Mike Grant would call the play of his career, a double reverse flee flicker from junior QB Grant Schaffer to wing back Jacob Woodring would get the Eagles a huge first down at the Wayzata 5 yard line and Larsen would put the game away with a scamper into the end zone to ice this contest.